Trust is important when it comes to any relationship and those within the workplace are no exception. Managers need to trust their workers, workers need to trust their managers, and employees need to be able to trust each other (teammates). And although we all know the value of having trust within an organization, we don’t always know how to develop it. The infographic is based on the Jacobs model—created by Employee Motivation Specialist Susanne Jacobs—for building trust between employers and employees. And exactly how does this model work? 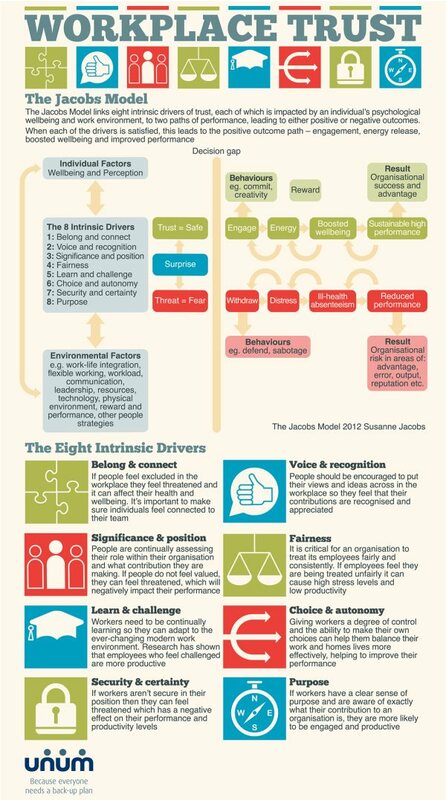 The model links eight intrinsic drivers of trust, each impacted by an individuals’ psychological wellbeing and work environment, to two paths of performance, leading to either positive or negative outcomes. When each of the drivers is satisfied, this leads to the positive outcome path—engagement, energy release, boosted wellbeing and improved performance. The two paths of performance are 1) trust, which leads to safety and 2) threat, which leads to fear. Any of the eight drivers can lead to either path of performance. For example, let’s look at the “fairness” driver. If worker A feels like her boss treats each team member fairly, then worker A will most likely follow the trust path of performance, which will produce positive outcomes. These could be that she is more engaged, gets along better with her manager and teammates and works harder to complete tasks, i.e. improving her performance. Yet, if worker A doesn’t feel like her boss treats each team member fairly (and is specifically unfair to her), she can follow the threat path of performance, which will produce negative outcomes. These can include worker A becoming disengaged and withdrawing (mentally or even physically) from her work or the company; distress as she becomes unhappy with how things are handled on her team; and reduced performance as she loses interest and/or commitment to her work. In college, I interned for multiple newspapers and magazines. During one internship, I noticed one of my managers didn’t particularly seem to care for me, at least not as much as the other intern (there were just two of us). I arrived at work every day at 8am. My head manager had a back office, but my and the other intern’s desk were next to the second manager, with my desk being the closest. Each day I arrived, I noticed the second manager would never speak to me (although I always greeted her). Yet, when the other intern arrived hours later, the second manager would automatically and enthusiastically greet her, sometimes even getting up from her seat and walking (past me) over to the intern’s desk to say hello. After awhile this blatant I-refuse-to-greet-Shala-when-she-comes-in attitude took its toll on me. Relating the drivers of trust, I did not feel like I belonged or was connected to the editorial team, especially since I was the only minority working there and the only person who seemed to never receive a pleasant “hello.” The situation also touched on the “significance and position” driver for me, making me feel less valued than the other intern. I also felt like my second manager was being unfair (another driver) as I didn’t feel I did anything for her to openly treat me differently. Because of my feelings and perspective, the path of performance I ended up taking was “threat,” which led to negative outcomes. Toward the end of the internship I felt disengaged and withdrew myself from daily office chatter and social outings. I made sure my negative feelings didn’t cause my performance to decrease though. So, what’s the purpose of my walk down memory lane? The Jacobs Model seems to be a true and effective tool for building trust in an organization (and work relationships) while also boosting employee engagement, and performance. After examining the model for yourself, what do you think Recruiter.com readers? Is the Jacobs Model an adequate tool for creating trust in the workplace?